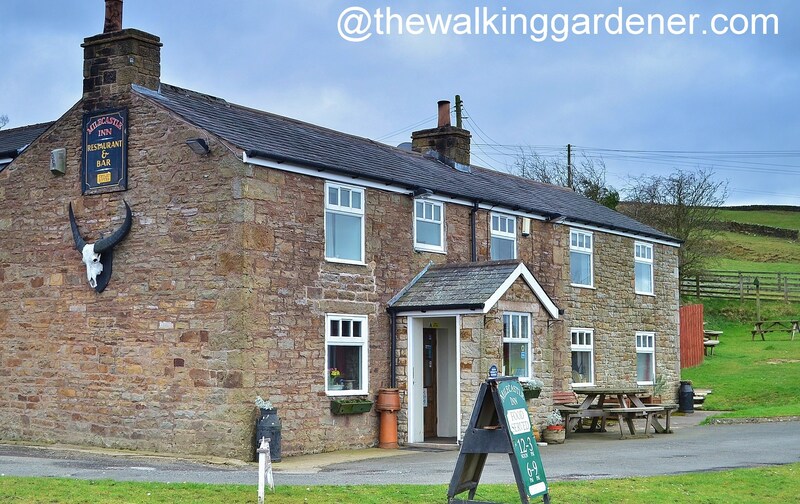 Stephen at Bush Nook cooked a huge breakfast and afterwards, as I sipped my coffee (and idly considered forgoing my walk and spending the day in his warm conservatory), he kindly offered me a lift down into Gilsland. For no good reason, I turned him down. It seemed cheating somehow to drive to the path – but, as I say, for no good reason. It wasn’t as if it was a pleasant walk back down that road with cars whizzing past, barely swerving to avoid me. 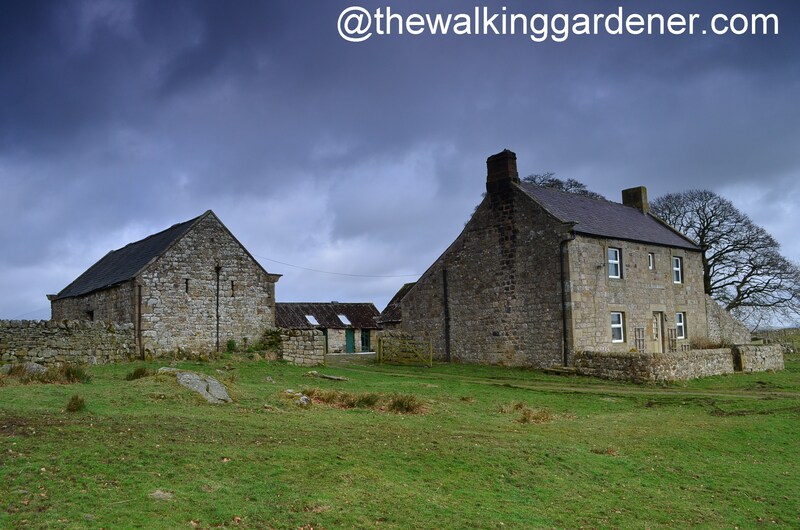 But it was quick, and soon I rejoined the Hadrian’s Wall Path, passing the sadly derelict vicarage on the outskirts of the village and heading for Poltruss Burn. This small stream is the boundary between Cumbria and Northumberland and as I crossed the footbridge, and left Cumbria behind, I saw the only dipper of my holiday. 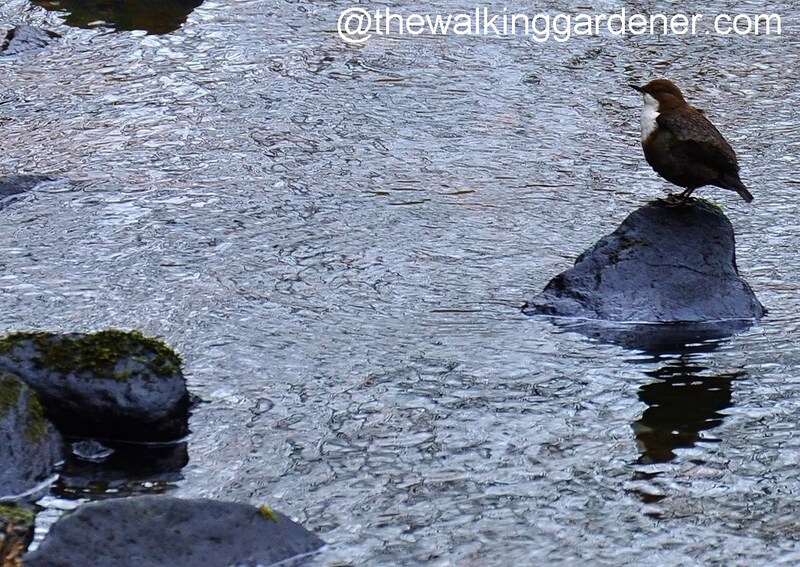 I’m very fond of dippers with their nimble ducking, diving and … dipping. 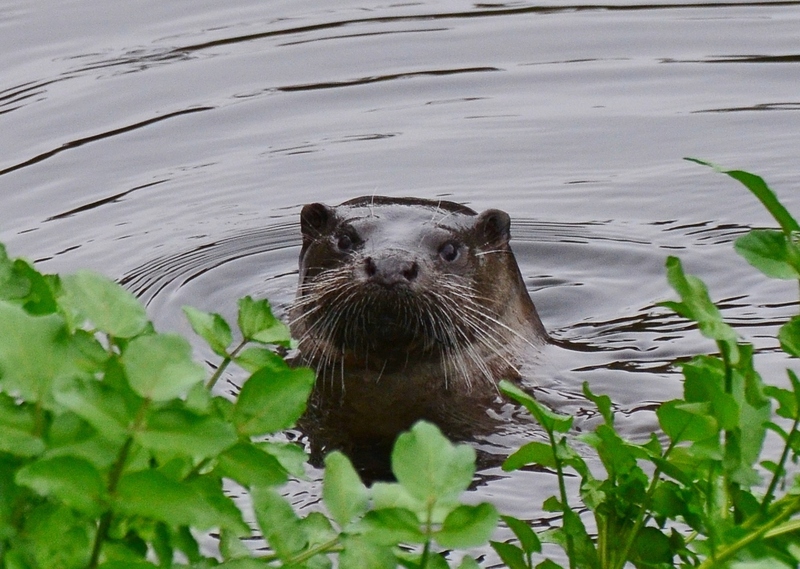 I see them most years on my northern walks and keep a swivelling eye open for a flash of white and black whilst walking by swift water. 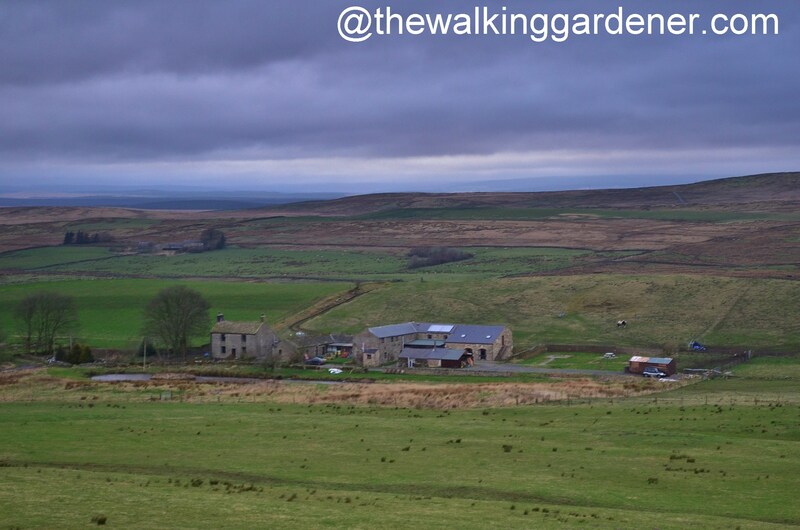 Unlike yesterday, I knew that there was a lunch-time pub just off route today so, forgoing a food-buying detour into Gilsland, I set off across country, following the north ditch. 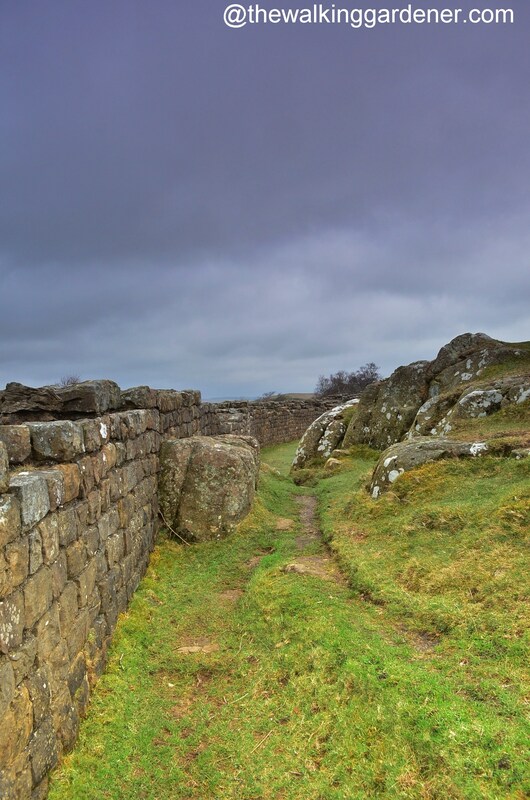 This deep ditch ran to the north (obvs) of the wall, whilst to the south was the massive vallum: a twenty-foot wide, ten-foot deep ditch and double embankment. 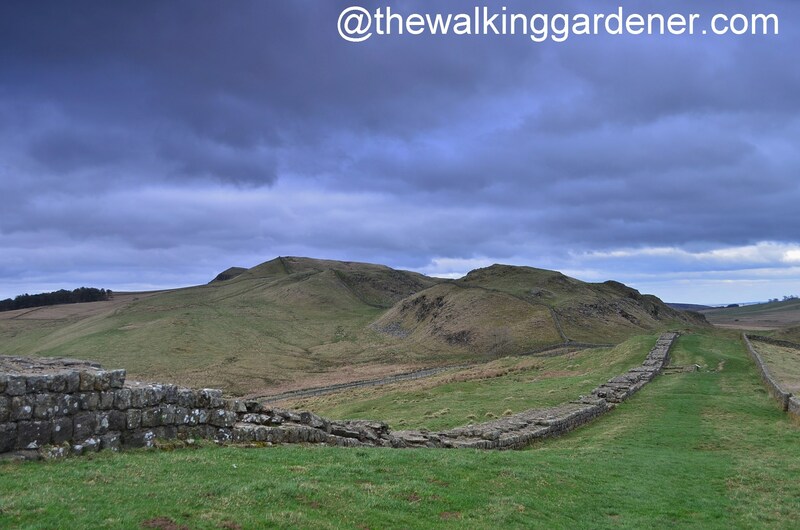 The vallum was a complex affair with camps, settlements, fortified crossing points and roads which changed and evolved considerably during centuries of Roman rule. We’re not entirely sure of its purpose but it and the north ditch might have created a military zone from which ‘civilians’ were excluded. 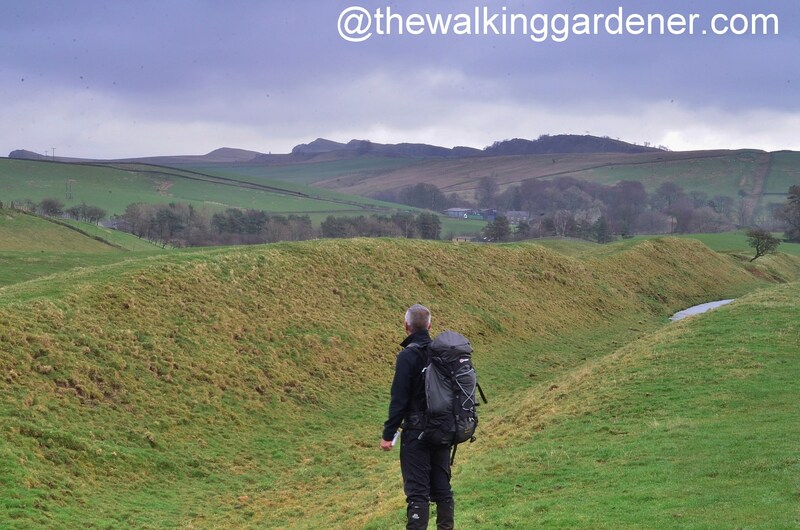 The north ditch is impressive though and puts Offa’s Dyke in the shade. 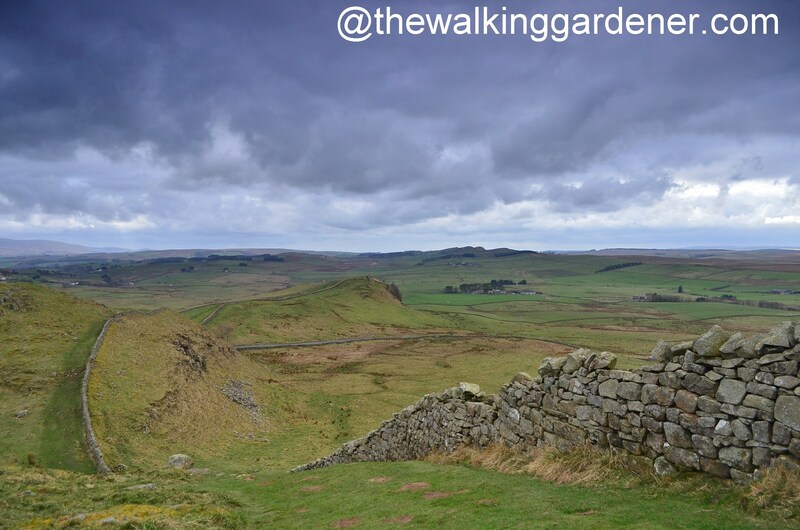 I would see it and the vallum again and again in the days to come but, like long stretches of Wall, they have mostly been wiped away. 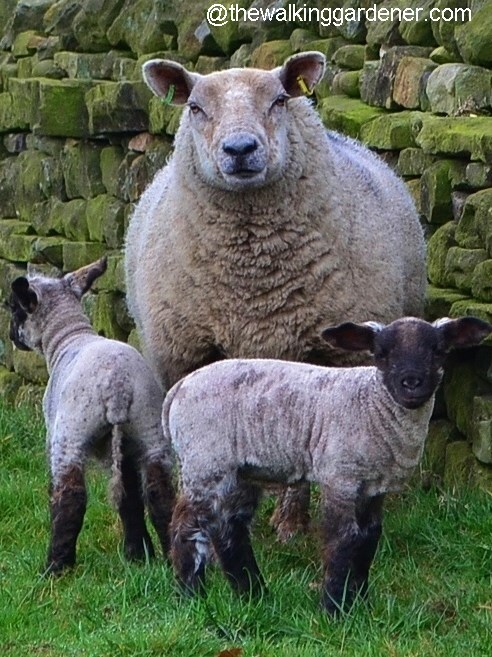 paused to watch another ewe and lambs; before the path carried me down to cross the Carlisle – Newcastle railway, joined with the Peninne Way and pulled me into the tiny settlement of Holmhead. 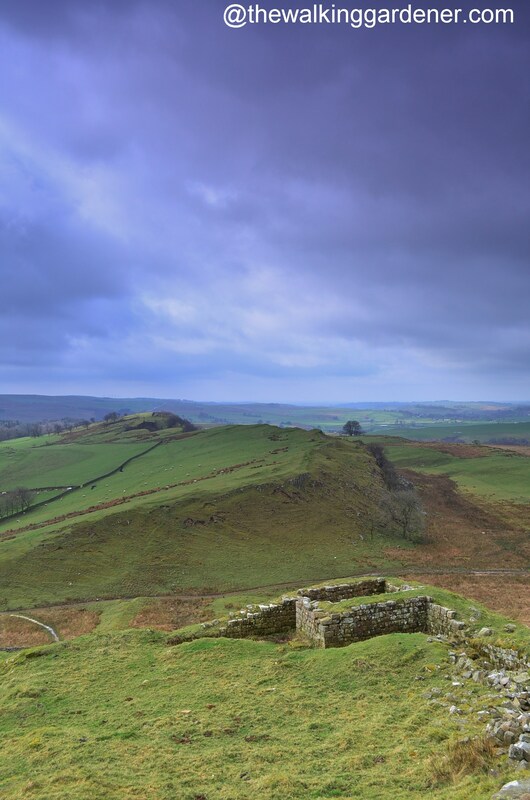 It was here in the early 1300s that John Thirlwall built a castle using stone he nicked from the Wall. 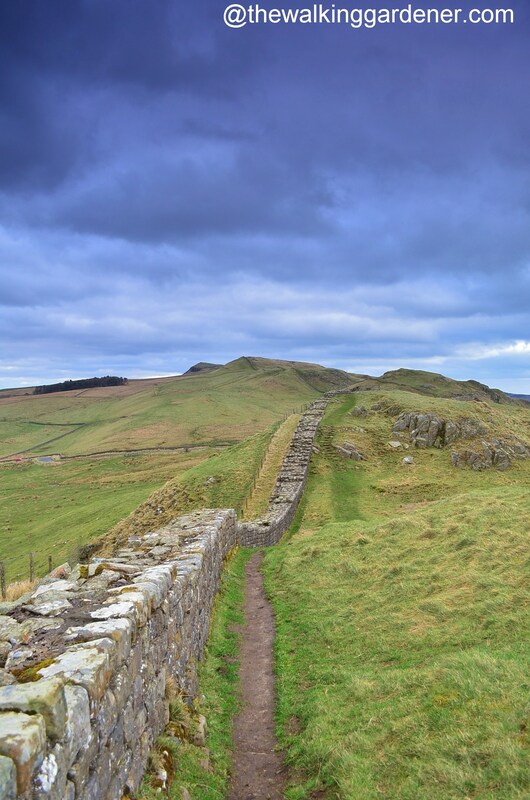 During the 14th and 15th centuries, the Borders was a dangerous place and this stronghold protected his family against raiding parties from across the border. 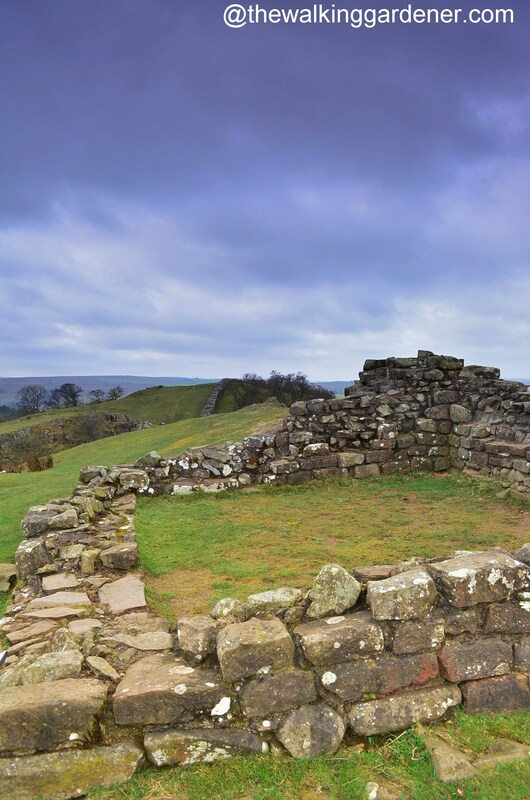 One tested method for capturing a castle was to burn firewood heaped against the wooden door. But it must have been an old trick even in John’s time: he built a ‘quenching hole’ above the castle’s door for pouring water down on to any fire. Canny. 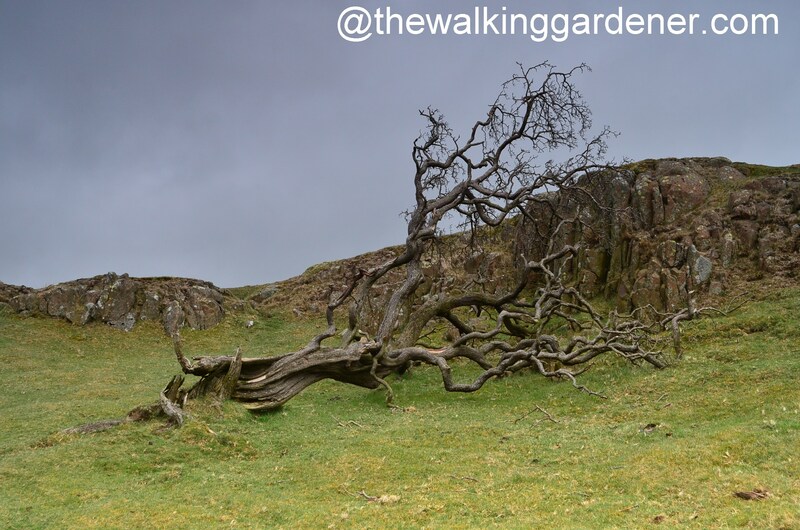 The path ahead would be a roller-coaster as the Wall hugged the superb defensive line of the undulating Whin Sill. After traipsing across many miles of gentle farmland, I was looking forward to climbing again: to rock and cliff and far off views. 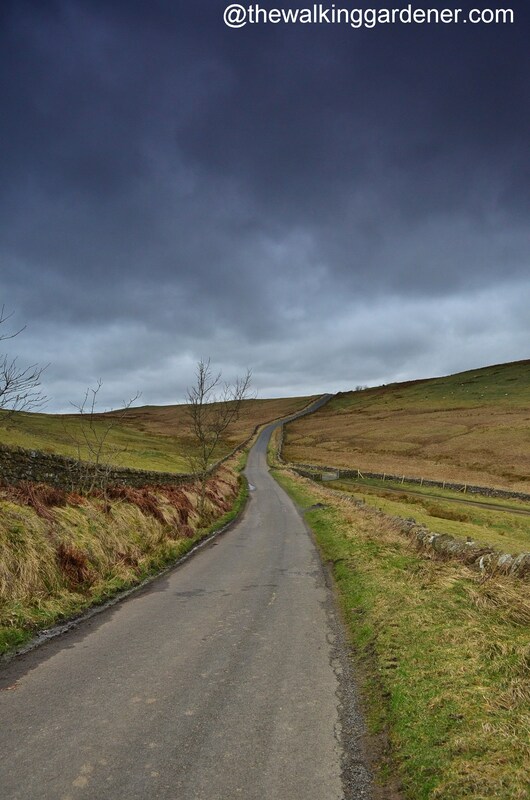 But a woman I met on the train to Ulverston, had told me that she found the HWP hard work after Walltown with many descents and immediate climbs. Forewarned, I started to gird my loins (but quickly realised I didn’t know how). 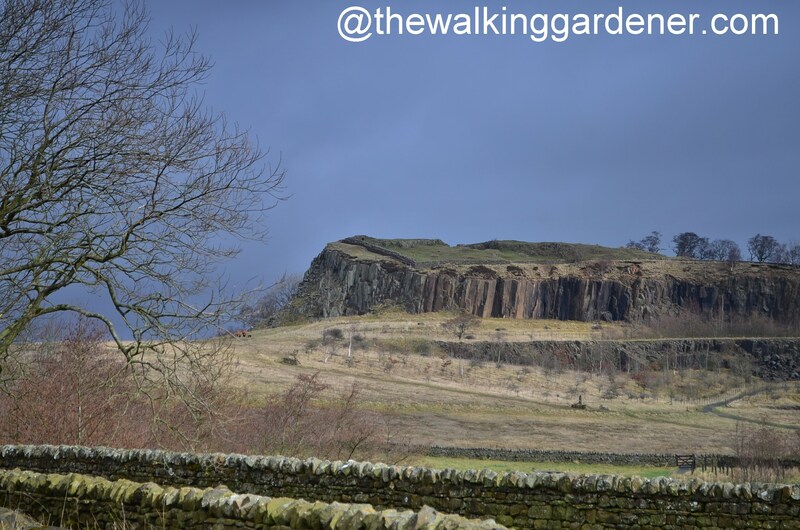 At Walltown Quarry I stopped for a quick breather, my daily apple and a swig of water, before climbing Walltown Crags … with ungirded loins. 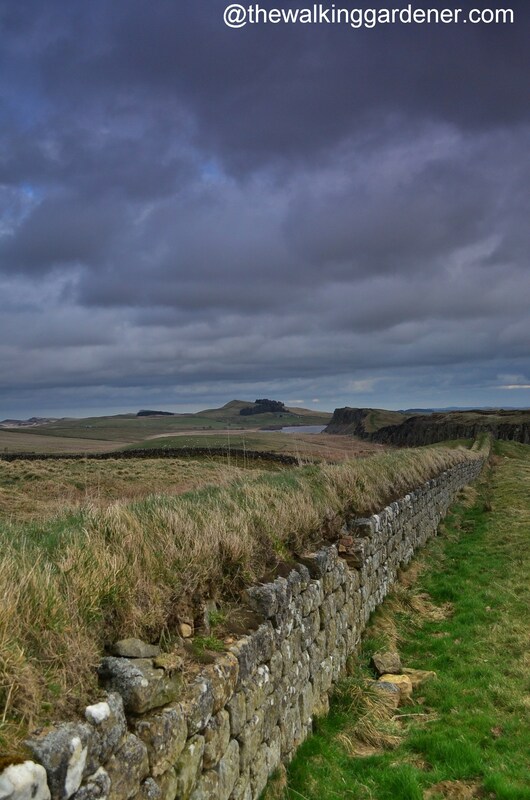 The best, longest section of Wall starts at the top of the Crags and would keep me company – almost without break – until beyond Housesteads: a distance of about 9 miles. 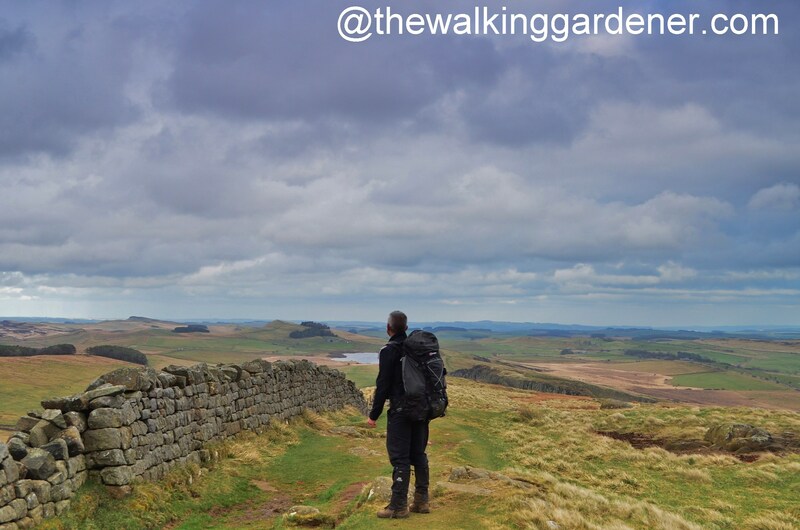 I was surprised by how few people I met on Hadrian’s Wall; especially as these next few miles were a definite highlight not only of the HWP but of my entire wriggly coast to coast walk. Heck, they were amongst the finest miles I’ve ever walked. a pair of equidistantly spaced observation towers or turrets. 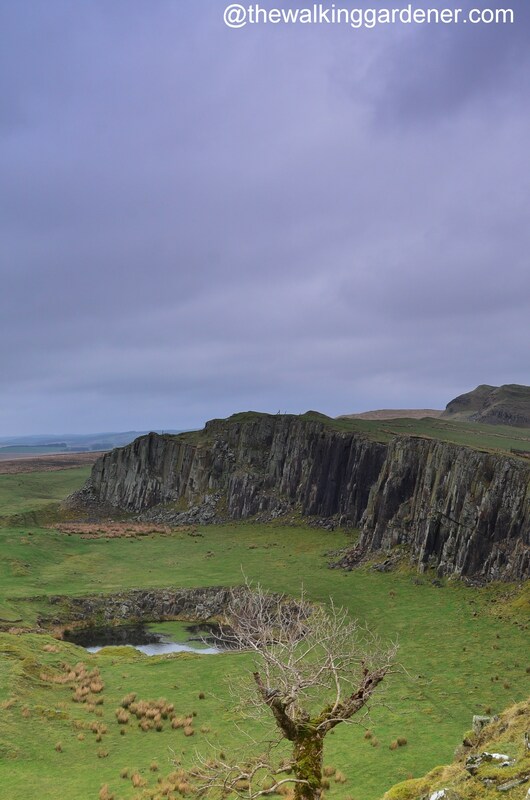 When the Roman north ditch-diggers hit the hard limestone of the Whin Sill they stopped. 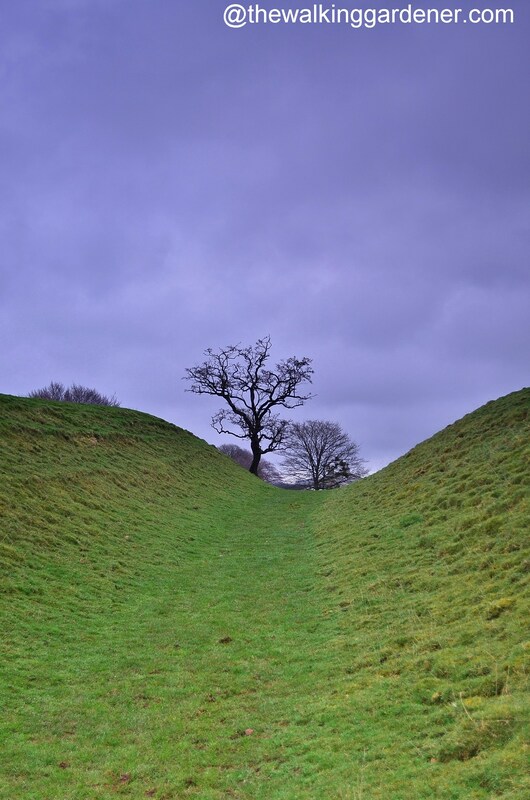 A ditch here would have been superfluous anyhow – but the vallum continued, diverted away southwards from the line of the Wall. As I’d been warned, the path dipped and climbed regularly but after a week’s walking and those Lakeland climbs, I found the repeated ascents surprisingly easy. 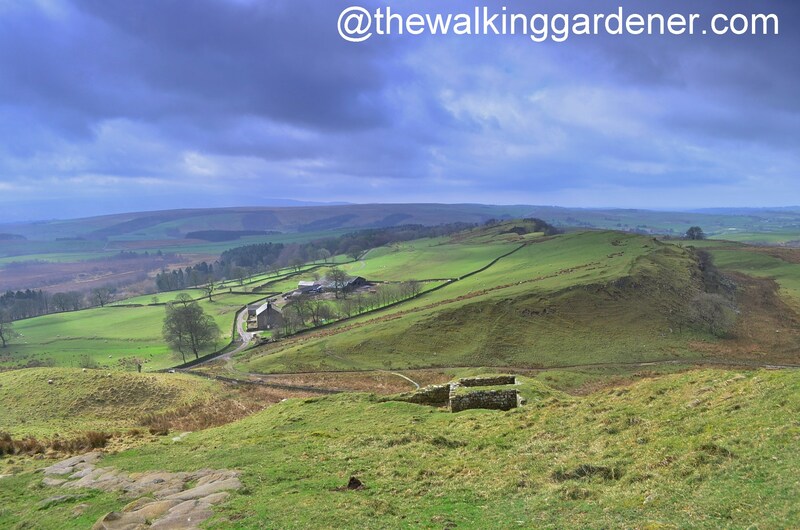 And if I did need pause for breath – the views were glorious. and sat perfectly in one of the finest views of my holiday. I commiserated with the young soldiers stationed in this bleak, cold, isolated outpost of Empire. And I understood how grateful one soldier was for the warm underwear sent to him by his mother. (A contemporary letter, inked on a sliver of bark, survives to provide this sweet detail). passed Great Chesters Farm and entered Aesica or Great Chesters Fort. There is little left of this particular fort; one of eleven that housed the auxiliary troops defending the border. 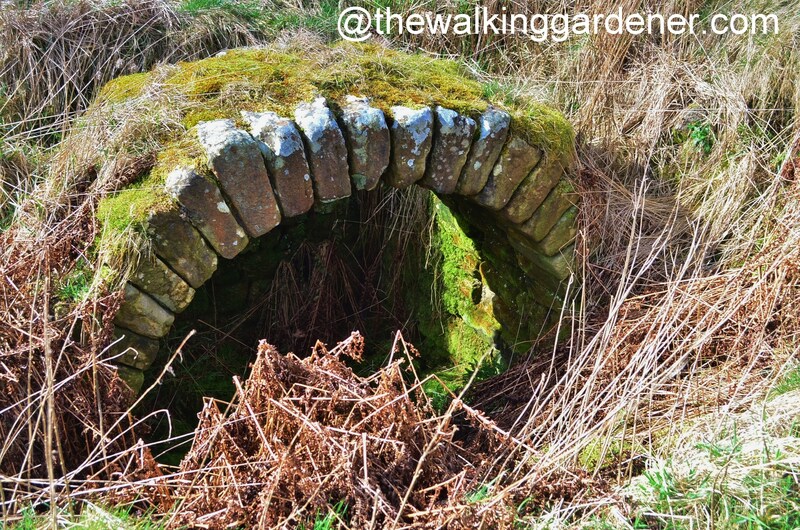 And what little does remain, seems surprisingly susceptible to cattle plodding amongst the ruins. 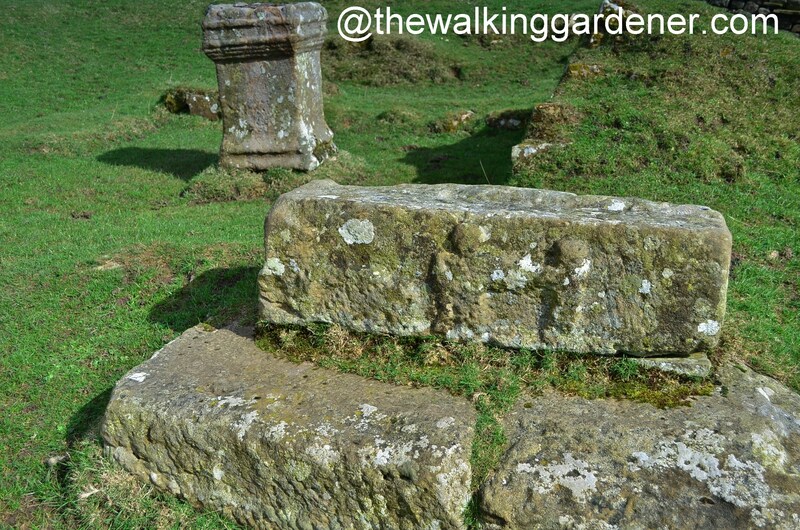 and there’s an altar and nearby carving of a soldier too. 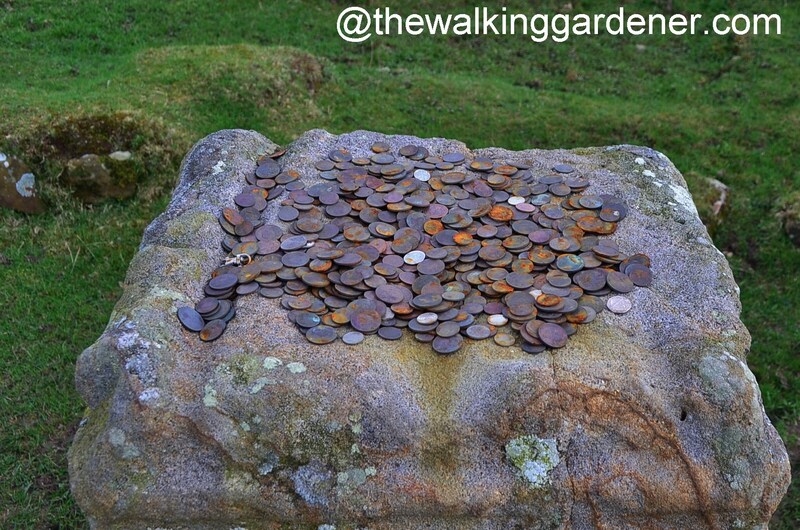 Almost twenty centuries old and people still leave offerings on the altar. My stomach was pestering me with demands for lunch and so, just beyond Aesica, I detoured off the path, followed a quiet road for several hundred yards, and sat grinning in the ‘Milecastle Inn.’ I supped excellent beer, before an excellent fire and demolished excellent pork belly and mashed potatoes with excellent, fresh veg. The latter especially was a treat after so many plates of chips and fried breakfasts. 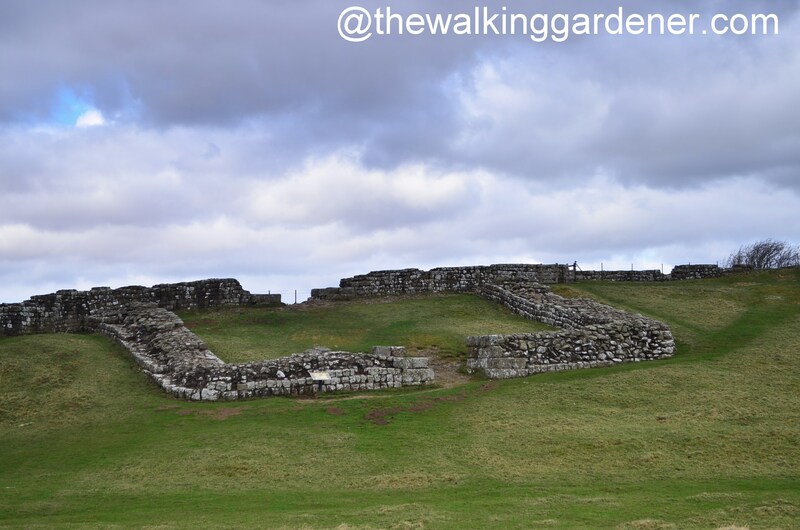 With a nicely taut belly, I strolled back to the Wall and rejoined it at the romantically named Milecastle 42. These ‘castles’ weren’t castles at all but fortified gateways allowing troops quick access to the badlands beyond. I had a very short afternoon ahead, with only 2½ miles of glorious isolation. I met no-one. 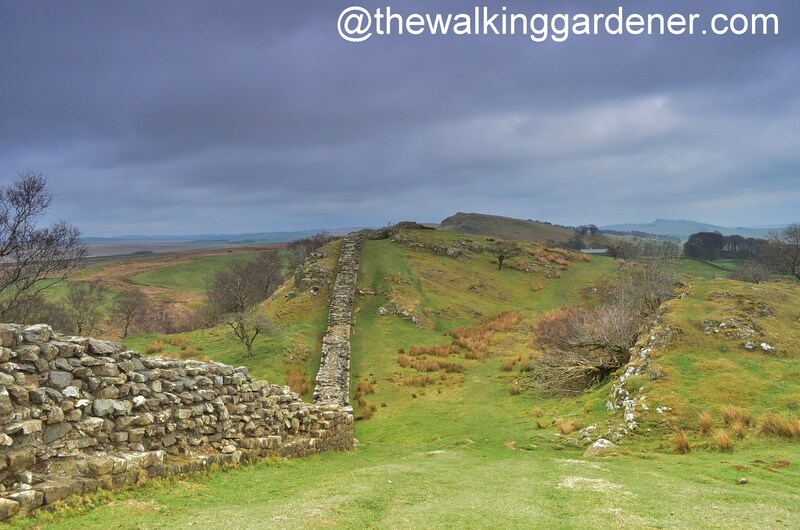 I slowed right down on this, my shortest day – planned as such to allow me time to explore Hadrian’s little endeavour. 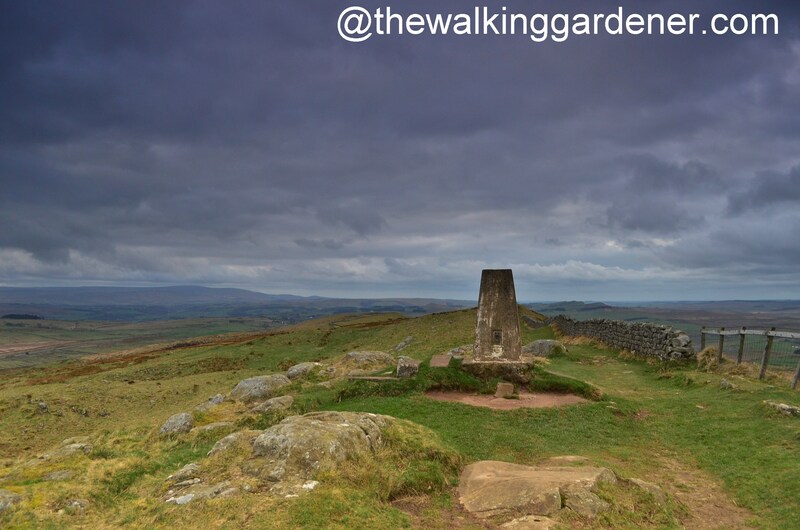 to reach Whinshields Crags. 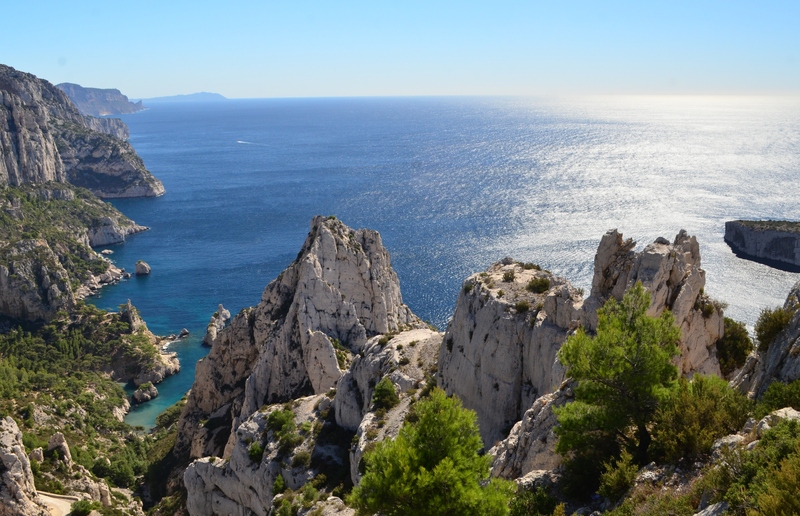 It is a modest highpoint – only 1132 feet. But it gave me a good view of the way ahead and tomorrow morning’s walk. I dug out my selfie cardboard cut-out (as used in the fourth photo from top) and set it up before taking a snap. 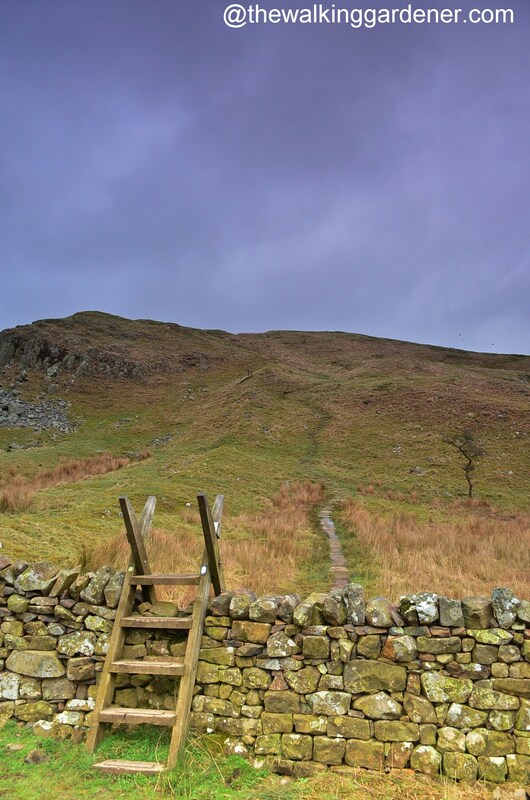 The path dropped me at Steel Rigg car park, where I left the HWP for the day. 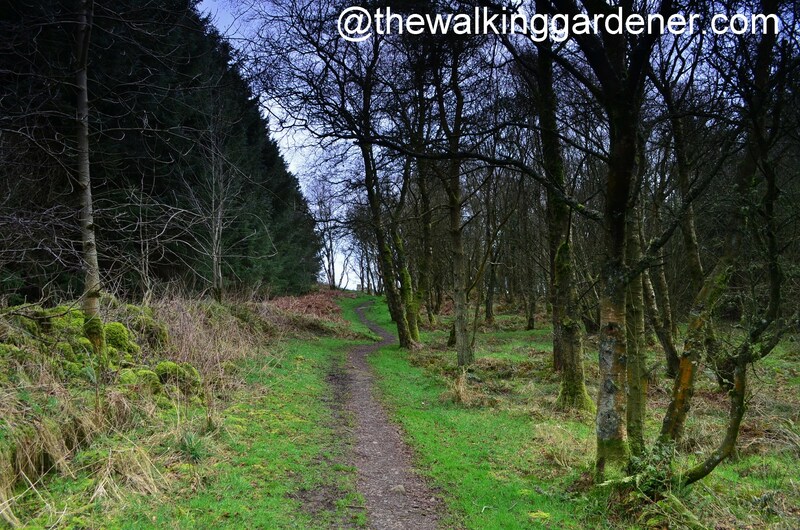 I followed a lane below the ridge for a final mile northwards to reach my B&B. 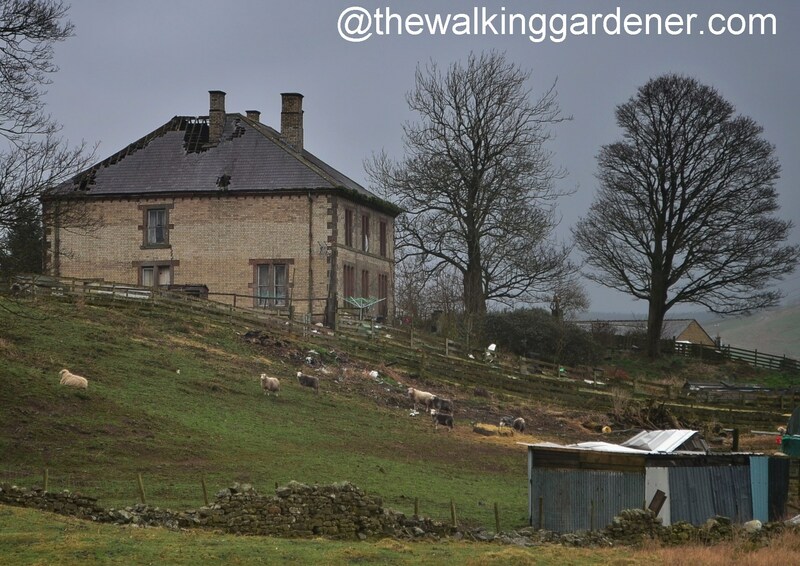 Saughy Rigg Farm was a favourite stopover. Sean, the owner, made me very welcome and after I’d showered and changed into some slightly cleaner clothes, he served me brilliant lamb shank. 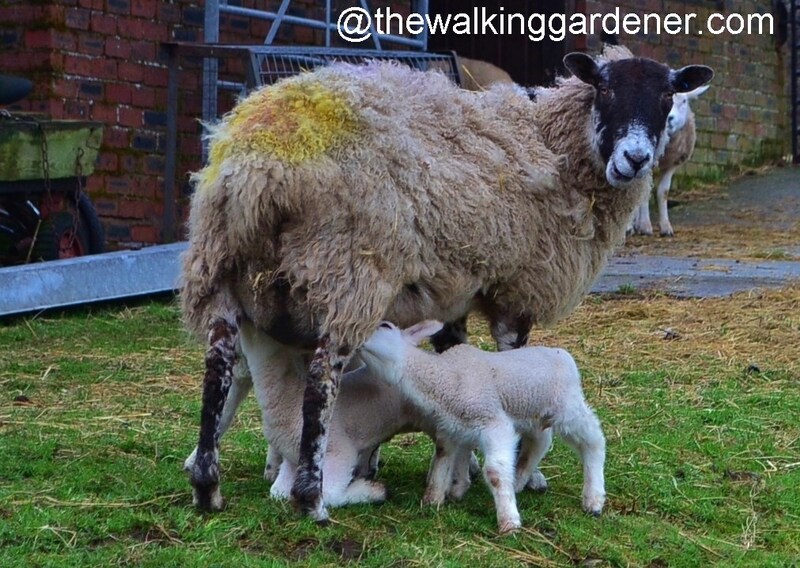 He told me that the lamb had been a pet and that its name was …… at which point, I stopped him. Bad enough eating his pet, worse still to know its name and hear warm, familial anecdotes. He offered me three courses but sadly after that big lunch I could only manage the one. Which was a crying shame – the food served at Saughy Rigg was superb and I doff my cap to the cook, Sean’s wife (who I didn’t meet and whose name I’m afraid I can’t remember). Those indigo skies are amazing (especially against the green, green grass). Makes me quite homesick. Love joining you on your walks though. I really enjoy vicarious participation in these extraordinary walks. What a moody, atmospheric, history haunted land. 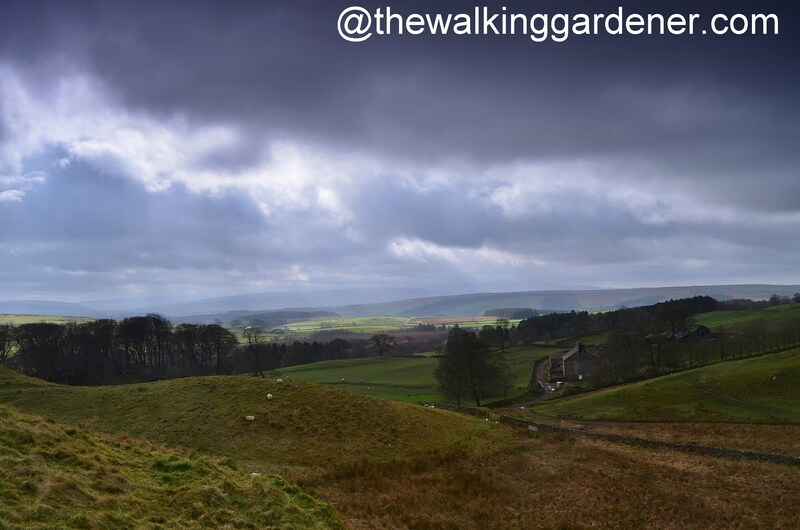 Hi James, I did wish for some sun and blue sky whilst walking but actually the dark sky did add enormously to the feel of my walk. And I did get the odd glimpse of sun too! Another great day and magnificent photos. Beautiful photos of gorgeous countryside. Thanks for sharing!